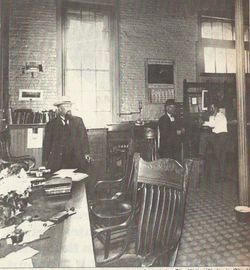 Superintendent Benjamin Stedman in his office at the City Water Works in City Hall in 1911. Photo courtesy: Center for Dubuque History and the Telegraph Herald. As a beverage, water is in no demand in Dubuque. that water is a good thing to use in extinguishing fires. Therefore, it is proposed to have a waterworks. Prior to the CIVIL WAR, two barrels of water cost twenty cents delivered in town and thirty-five cents transported to the bluffs. A plan to pump river water into the city was stopped when its quality was unfavorably compared to the quality of local beer. On July 31, 1871, the first water pipe in Iowa was laid between Main and Iowa on Seventh. (14) The same year, cast-iron mains were laid in the north-south alleys. A party was held on August 22, 1871, at which many of Dubuque's prominent businessmen journeyed through the tunnel inspecting the water supply. (15) The tunnel ran back under the future site of BUNKER HILL GOLF COURSE at a depth of one hundred eighty feet. Concern about the supply of water arose in July of 1879. The Dubuque Herald reported that N. W. Kimball, superintendent of the water works, informed the paper that at no time during the last week did the level of water in the reservoir fall below thirteen or fourteen feet. per year when 250 are in use. 3. Flush tanks for sanitary sewers at $20 annually. to all ordinances relating to excavating of streets. to exceed one of each for every 25 hydrants. exceed $6 per annum for each block or square. company so amended as to comply with the foregoing sections. its franchise shall be $250,000. Reaction to the proposed sale were cautious. Judge Benjamin William LACY contended that the eleven stipulations of the council were minor compared to the value of the works. Alderman Crawford doubted that the city could purchase the water system. The Pittsburgh company had offered $350,000 and was also willing to assume a debt of $40,000. A committee of fifty citizens was announced with William J. KNIGHT as chairperson, that would meet with the council to decide whether the city should purchase the water system and improve it or waive its right to purchase it and let it pass into the hands of the Pittsburgh company. (49) As reported in the Dubuque Daily Herald on September 23, 1892 the unanimous view of the committee after its first meeting was that the city should retain its control of the water supply. In July 1894 the water supplied to the citizens was found to be unhealthy despite promises made two years previously to improve it. With increased usage to water lawns and streets during the dry season, the supply of well water was insufficient. River water had to be used. When samples were sent to the state health authorities for testing, a variety of contaminants were discovered. Remedies were to install filters and dig wells. It was also believed that the present equipment was not of sufficient capacity to handle the demand. (52) Within a day of the city council announcing that it was considering canceling the charter within thirty days, the company responded that it could make improvements if some cuts in demand were made. The water company responded that it had never been obligated to furnish water pressure or power sufficient to fight a fire. It had been providing Dubuque, a city of approximately 40,000, for six weeks with 5 million gallons daily or roughly 150 gallons per person. The pumping capacity of the company was sufficient to provide a city of 100,000 people with 70 gallons daily. All the citizens of the city, however, were not connected to the system, therefore, the company claimed there was great waste especially by those using lawn sprinklers which operated at all hours. Notices from the company to many consumers had been ignored. (54) On August 5, 1894, the company announced that lawn watering in the hill area had to end until a pump was fixed. When the work was completed, watering had to follow company rules of one hour in the morning and evening. The Water Company responded the following day with a letter in the Daily Herald stating that new wells near EAGLE POINT would increase the supply of water and not because the current wells had been providing impure water. The letter went on to state that quality of water had always taken preference over cost and that sometimes the owners had to contribute more of their own funds to provide the service desired. In 1910 the water works trustees published "The Water Works Today," a pamphlet informing the public about the improvements made to the plant. Loemker, Herman J., 1868-1937, “[1914 city reservoir construction, Dubuque, Iowa],” Loras College Digital Collections, accessed December 27, 2015, https://digitalcollections.loras.edu/items/show/307. ], Loras College Digital Collections, accessed December 27, 2015, https://digitalcollections.loras.edu/items/show/330. The use of spring water was discontinued completely in 1950 when the purity of the water began to decline. Reservoirs off Kaufmann Avenue were maintained for emergency use only. A "high" system supplied water to the hill areas, while a "low" system served downtown. In the 1950s an "intermediate" system was built to supply water to Eagle Point and the Windsor Avenue areas. 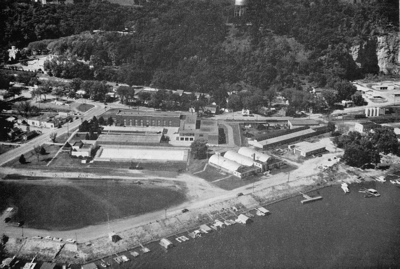 The largest reservoir in Dubuque, with a capacity of over seven million gallons of water, was located at West Third and Birch. Dubuque's wells have been estimated to have the capacity of supplying water to a population of over one million people. 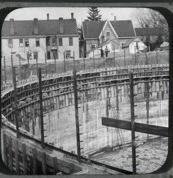 Construction projects in 1963 included building a 2.5 million gallon standpipe near Asbury and Carter, a 1.5 million gallon tank at Gay and Muscatine, and a booster station at the same site. 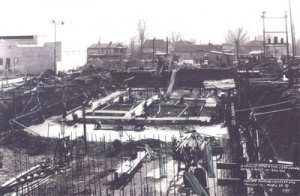 The construction provided more water volume in the hill area and north of 24th St. Better fire protection was declared to be a benefit. In 1971 the difficulties of dealing with an aged water system received public attention. Beginning in October, water department officials noticed a sudden increase of several hundred thousand gallons of daily water usage. This rose to a million gallons daily at a time when the entire city was typically using 7.2 million gallons. After questioning local industries and finding no new water usage, special phone tabs were used to listen to water mains to determine water flow. The highest monthly average of 10.05 million gallons and the maximum daily demand both occurred in June 1958. During fiscal year 1989 the average daily water demand in Dubuque was 7.9 million gallons or approximately 132 gallons per person per day. During the drought of July 1989, demand averaged 11.8 million gallons for a six-day period. Residential use accounted, during 1989, for 54 percent of the water pumped in Dubuque. Industrial use equaled 38 percent. On September 17, 2009 International Business Machines (IBM) and the City of Dubuque, Iowa announced a partnership aimed at making the city one of the first "smarter" sustainable cities in the United States. (101) The first phase of the smart city partnership included a project to increase the city's and its citizens' understanding of water management. To accomplish this, IBM developed a "Platform for Real-time Integrated Sustainability Monitoring" to provide the city with an integrated view of its energy management, including energy consumed by the electric grid, water system, and general city services. 11. 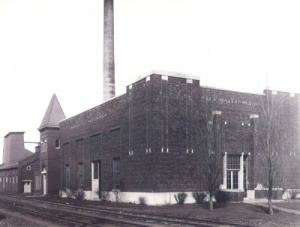 "Dubuque Plant Called One of the Finest..."
38. 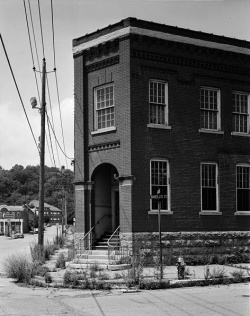 "Dubuque Plant Called One of the Finest..."
43. "Dubuque Plant Called One of the Finest..."
60. "Dubuque Plant Call One of the Finest..."
68. "Dubuque Plant Called One of the Finest..."
75. "History of Dubuque and Dubuque County,"
79. Phase V Architectural/Historical Survey/Evaluation Final Report. Online: http://weblink.cityofdubuque.org/WebLink8/DocView.aspx?id=44950&page=1&searchid=9d0a32ca-655e-4868-b2d1-db38eb62e79b, p.
92. "Dubuque Water Supply Fluoridated..."